Anihan Graduate Jasmine De Leon gave her testimony during Anihan's 28th Commencement Excercises. Jasmin de Leon graduated from Anihan in 2006. She started working at the Palms Country Club as Commis One. After some years, she was promoted as Sous Chef of the Central Kitchen of the Country Club. I remember when I was in high school, I was really eager to go to college, but my family couldn’t afford to send me to the colleges and universities in our town. At that time, Anihan conducted a career orientation in our school and I passed their entrance examination. After that, I completed the requirements, an interview and another exam. I was afraid that I would not qualify for the scholarship. I was starting to feel discouraged and I asked myself if was really meant for Anihan. I cried and even my mother felt the same way too. I was about to give up when Ms. Meldy, an Anihan teacher at that time, personally came to our house and told me that I needed to report to Anihan. At first, I was confused since I was sure that did not qualify for the scholarship. Ms. Meldy assured me that I will be able to enroll at Anihan. Studying was not easy for me. I encountered a lot of trials and problems that challenged me. I can’t count on my fingers how many times I felt like giving up and cried. Thanks to my brother who helped me financially and the support of my family, I was able to finish the course. 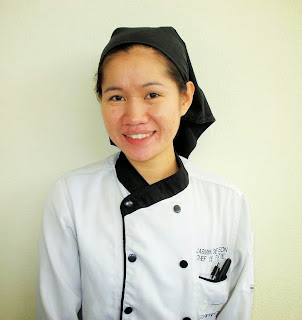 When the time came for us to undergo our On the Job Training, we were advised by our OJT mentor at that time, Ms. Pam, that I needed to report to The Palms Country Club at Filinvest, Alabang. The Palms Country Club is a membership club that redefines club lifestyle. It is a perfect place for the family and also for business associates need for privacy, security, convenience and relaxation. I was challenged during the OJT and I cried for so many times. Even if I was only a trainee, they treated me as an employee. I was trained by Executive Chef Hans Neukom, who is also now the General Manager of The Palms. In my first month of working at The Palms, there was an instance when Chef Hans ordered me to make a corndog. I thought it was going to be a show cooking and so I waited for my supervisor to call me for my turn. While waiting, Chef Hans looked for me and the corndog that I was supposed to make. It was too late when I realized that it was not for show cooking but for a buffet set-up. I admitted my fault. I learned that miscommunications can definitely result in wrong actions. So, my advice is, don’t be afraid to ask. As the saying goes, “You`ll never know unless you ask.” Chef Hans is a strict boss and I have learned a lot from him. The way he works so as to be able to get the best results inspire me. I can say that I have absorbed some of his attitudes in terms of work. Going back to after I graduated on April 7, 2006, The Palms Country Club absorbed me and I started as a casual employee by April 11, 2006 – that was five days after graduation. On February 17, 2008, I became a regular employee. By that time, I have proved to myself that my dreams have come true. I was able to provide the needs of my family. Right now, I also send my younger brother to college. I thank God for all those blessings. He is always there every time that I need Him. From being a regular employee, I was promoted as Commis. After that, Chef de Partie, and the following year, Junior Sous Chef. Through hard work and dedication, I received an award for being an Employee of the Month and the other is Emloyee of the Year last 2011. By God`s grace I promoted as Sous Chef last November 2014. I continue to dream. I attend different trainings and seminars. One of those is in Cebu, on “How to Make Firewood Pizza” and recently, in Tagaytay, on “US Meat Culinary Training Camp”. Looking back to where I started, I can say that I have grown to become a better person. I owe to Anihan Technical School where I am and what I am now. They taught me how to become a better person not only physically, morally, mentally but most especially, spiritually. After studying in Anihan, setting out into the world full of dreams is so exciting. I hope you, the new graduates, will find what you search for. I hope, too, that you can find at least one thing you can do that will make your life better.